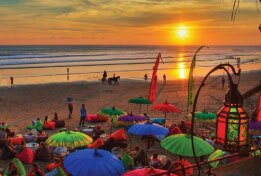 Travelpotato.com |Bali Holiday Packages Best of Europe!! Curated especially for you!! Sunset dinner cruise. Once the sun goes down, step aboard for a night of romantic floating fun. Enjoy live entertainment with your appetizing International Buffet Dinner served on the main deck. Dance the night away with the on board DJ. Full day Kintamani & Ubud tour with local lunch at Kintamani. Home to 5 volcanoes, including the sacred Mt. Agung, Kintamani and Mt. Batur must rank among the most dramatic and accessible live volcanoes to be found anywhere. 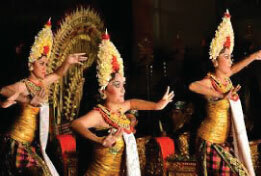 The hair-raising sounds and rhythms of the kecak form the most lasting, haunting memory for many visitors to Bali. Men and boys sitting in concentric circles slide into trance as they chant and sing in lively counterpoint, the only music to accompany a dance re-enactment from the Hindu epic Ramayana. luwatu Clift, where one of the most important Hindus temple were built on the top of clift. The hair-raising sounds and rhythms of the kecak form the most lasting, haunting memory for many visitors to Bali. Bali has a lot to offer in terms of experience and beauty. From soothing landscapes to happening night parties to fun-filled beach days - Bali comes as a perfect destination for family getaways. Bali Family Holiday Packages offer chances of full-enjoyment to every member of the family, across all age groups. A plentiful of family packages to Bali are offered by the industry to cater to the needs of different clienteles with varying budgets. 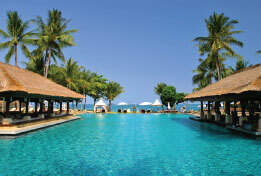 From economical trips to Bali to ultra luxurious Bali getaways, the packages come in every duration and costing. 4N Hotel accommodation with daily breakfast. Sunset dinner cruise on private basis. Full day Kintamani & Ubund Tour with local lunch at Kintamani on private basis. One round of Banana Boat, Parasailing or Jet Ski on private basis. Return airport transfers in private basis.